toilet, combination tub/shower, Excellent for evening baths for kids. toilet, shower, Large, with built-in seat. Adjustable sprayhead for kids..
Gorgeous view from 7th floor balcony. You can also see it from the Master bedroom and the livingroom. Local and emergency request calls only. Long distance calls blocked. Bike and treadmill indoors near elevator on 2nd floor. Free-available in unit and public areas. Robust! Fast! Enough for my business! 2 swivel rocking chairs add to TV viewing pleasure. Extras, like storage containers, hot pads, corn holders, etc. 5 chairs at dining table (current configuration) PLUS 2 High Stools at Counter. In right balcony closet, unlocked. 2 new Rocking Chairs, snack tables with 4 side chairs. Indoor heated pool and hot tub; Outdoor pool and kiddie pool. 2 KING BEDS! Please No Smoking Inside, Oceanfront Balcony, Oceanfront Indoor Heated Pool and Hot Tub, Oceanfront Outdoor Pool and Kiddie Pool, Saline Treatment in pools, Kid Crib, Large Sundeck with Lounge Chairs, 2 Picnic Areas with Charcoal Grills (BBQ), Fitness Room, 3 Cable TV's, 2 DVD/VCRs, DVD/CD/Stereo, 2 Ceiling Fans, Wet Bar, Microwave, Coffee Maker, Toaster Oven, Blender, Iron & Ironing Board, Games & Puzzles, Videos, Books, Secured Building requires key to enter. No Motorcycles or Trailers. Reduced Security Deposit for repeat guests. We rented the house with another family for our children's spring break. It was a lot of fun we extended the trip at another property because this one was booked.this was on the ocean, nice and clean. Pls remember to bring your own toilet paper and kitchen napkins. Maybe bleach in case u are OCD like my family. It was nice and fun all around. Four of us enjoyed a weekend in the area as two competed in the Sunset Beach 1/2 marathon. 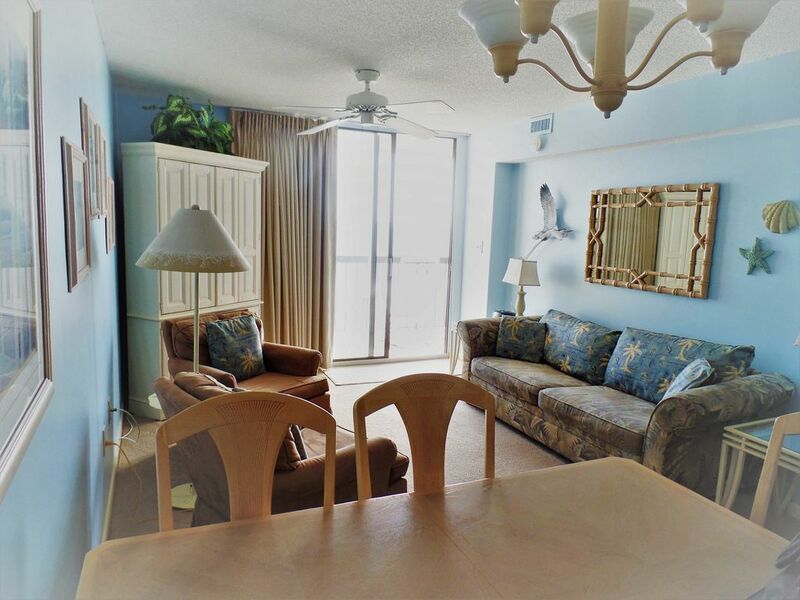 Very comfortable, clean and accommodating condo--fantastic location, too. Thank you!!! Balcony faces Ocean directly. Sunning, Walking, Jogging, Shell Collecting, Sand Castles and Biking on the Beach. Local Playground ~.5mi walk. Water Parks. Go-cart Parks, Aquarium, Nightclubs, Shag Dancing, Casino Cruise Nightly. Historic Plantations. Did I mention Shopping? Lots!!! Barefoot Landing 1mi. Tanger Outlet ~4mi. Security deposit may be reduced or waived for previous renters. From June-September we ONLY rent weekly Sat-Sat.